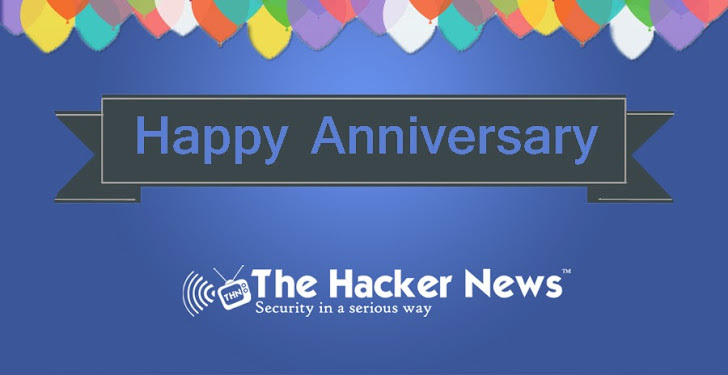 The World's First Dedicated Hacking and Cyber Security News platform - 'The Hacker News' is celebrating its 3rd Anniversary today. When we began our journey 5 years back as a Small Local Community of few Hackers and Researchers, we had the dream of providing the Hacking Community with World's first Hacking News Platform. We wanted to gift them their own trusted news platform. A Unique Platform which is run by Hackers and was dedicated to hackers, a platform which is free from Censorship, Conventions, Governments and Borders. In the last 5 years of our Dedicated service to Hacking and Security community we have grown into a huge family of more than One Million Google+ Followers, 200 thousand Facebook Fans, and 100 thousand Twitter Followers with Two Million Readers Monthly and the family keeps growing with new members everyday. In our journey of THN, we have seen the cyber world growing from Defacement to most Sophisticated cyber crimes of the Decade i.e Stuxnet and Flame Malwares. We have seen individual hacker joining together and making some of the most admired hacking groups like Syrian Electronic Army, Lulzsec, APT China. We have seen the largest hacking collectives like Anonymous group. But we have also seen some of the most celebrated portals being busted by Governments i.e. Liberty Reserve, Megaupload, Silk Road. We have seen the surveillance programs like PRISM by NSA which has threatened our Privacy and Technology. We have seen young hackers giving up their precious lives due to government i.e. Topiary, Barrett Brown, Jeremy Hammond. Today we are dedicating this anniversary to the courage of Edward Snowden, to the service of Julian Assange of Wikileaks and to the memory of Aaron Swartz. In between these celebrations, we would like to thank every single Hacker, Researcher, Journalist, Enthusiast who has contributed to our phenomenal growth. We all are obliged to take Security in a Serious way. We promise to serve you with our best. Make sure that you never miss our latest THN Stories, so Subscribe free updates right straight from our website to your Email Inbox.